25000mAh Solar charger, you can safely bring the Solar Panel Charger to the plane for using. 1.25000 mAh Monster High Capacity: Get freedom from your wall for over a week. 2.Superior Safety: Ayyie solar battery charger intelligent surge protection against over-charging, which would keep you and your devices safe. Long lifespan: with more than 500 recharging times. 4.36 LED Super-Bright Light, very convenience for your trip, camping, hiking or other outdoor activities. 1. We suggest you fully recharge it via wall charger at the beginning to make the power battery fully activate. 2. Do not dispose of it in fire or water (underwater more than 1M ). For safety, DO NOT leave the solar power bank charging in a car in case of high temperature and avoid crashing. 3. Please charge the Solar Phone Charger once a month if you don't use it often, which can prolong its life cycle. Please ensure there are 50% of electricity in it if you don't use it for a long time. In any state, double-click the button to turn on the LED lighting. The lighting is divided into three brightness levels: high, medium and low. The brightness can be switched by pressing a single button. At any brightness, double-click the button to turn off it. The product automatically memorizes the brightness level when the light is turned off. 【MONSTER HIGH CAPACITY 】Built-in 25000mAh high capacity polymer battery equipped, Hold it go traveling with a FULL sense of security. Suitable for most of digital equipment. The solar phone charger can charge up your phone for 7+ times if the battery has full energy. You no longer need to worry about your phone battery with it. 【3-Port USB Output Charging & 36 Pcs Super Bright LED Light 】Allow you to charge 3 digital devices simultaneously very fast. 2A USB port for iPad/Tablets, 2A USB ports for iPhone, android phone and any other 5V USB-charged devices. 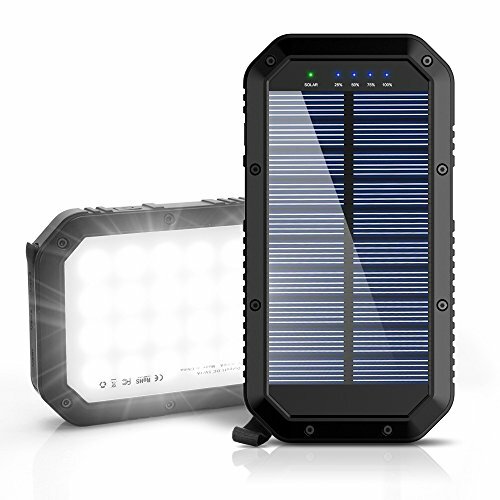 The solar power bank built in 36 LED light can be as a flashlight, It's very convenience for you to camping, hiking or other outdoor activities. 【Friendly Reminder】Solar Charging is a charging way for emergency use, and solar panel charging efficiency will be influenced by natural conditions and random factors, such as day and night, season winter and summer, geographical latitude and height above sea level, sunny, cloudy, rainy and so on. Please charge it by line for daily use. 【What you get】25000mAh Solar Charger, FREE Hook, User manual, USB Cable Included. You could hang it on your backpack or whatever on the go to charge by solar. Fashionable and eye-catching design, 4 integrated LED indicators to show power status. 12-Months Warranty - Friendly Customer Service within 24 hours. If you have any questions about this product by Ayyie, contact us by completing and submitting the form below. If you are looking for a specif part number, please include it with your message.